Do you sometimes feel tired, old or sick? Haven’t you asked yourself at least once “where’s my energy”? Do you feel lazy most of the time? In the world of today, where everything seems to be going forward, our bodies unfortunately don’t seem to go that way. We hardly even notice the damage we do to our bodies every day. It’s the weekend, so why not drink a glass or two of alcohol. It’s fun, right? Well, your body doesn’t think so. Do you cook? Who has time for that? We’re always in a hurry to get somewhere on time, so we might as well grab something to eat on our way to work. Yes, a burger would be okay, or a toast, or some French fries. That’s not such a good idea after all. Processed and refined foods are the first to blame for the toxins in your body.These include foods that are usually canned, packaged or boxed. And what if you have been ill for a week or two, and had to take some medications. Medications have their ups and downs. Positive outcomes – they cure the illness and make you feel better. Negative outcomes – parts of their chemicals and toxins remain in your system and need to be flushed out. Even things that are not your fault, like air pollutants or water pollutants are responsible for the toxins in your body, and you can hardly avoid those. The environment we live in is loaded with toxins. If you found yourself in any of the above situations, you’re on the right track. There is a way to start fresh, to clean your body inside out. If you wish to restore your energy and feel clean again, detoxification is what you need. Detoxification or cleansing is the process of getting rid of potentially harmful substances in your body, or in other words – cleaning the toxins out of your body. The outcomes of detoxification are good for our health. With detoxing your body, you increase your energy level, you boost the function of your immune system, you get that long lost glow on your skin, you look younger, youreduce the stress that toxins usually cause and eventually you get rid of fat. Fat-soluble toxins are found in your fat cells, and every day your cells release small amounts of those toxins in your bloodstream. When you manage to get rid of these fat-soluble toxins, you can lose fat more easily. Makes sense, doesn’t it? Detoxification in order to purify the body and the mind was practiced thousands of years ago. It is said that cleaning your body from toxins is not only a physical, but also a spiritual thing. Not only it helps with all the mechanical processes of your body, but it also clears and liberates your mind. There are many ways to detox and cleanse your body. They all include eating changes, colon and liver cleansing.Some of them are more rigorous than others. However, no matter which method you prefer, detoxification is a process which should be at least 3 days long. Some methods suggest that you should drink only water or juices, so called ‘fasting’. But it is for the best if we add something to make it less difficult and more nutritious. Water! The more you drink, the better! Drink lots of water every day. Don’t let an hour pass by without water. If you can stick to it, it is better if you drink only water for the first 24 hours of your cleansing process. Juices! Fruit or vegetable juices, both are full of vitamins and fiber. If possible, it is better that you take your daily dose of fruits and vegetables through fresh juices. Exercise! Sweat those toxins out of your body. Moving will also enhance digestion and by that help you to get rid of all that is unnecessary. Just be careful not to exaggerate because you might feel weak from the detox process. Sauna! This makes total sense. Sweat the toxins through your skin in the sauna. Your body will be very thankful for this. Exfoliate skin toxins! Skin brushing products will get rid of the toxins on your skin quickly. Exfoliation will also help improving your circulation. Vitamin C! While detoxing, take vitamin C regularly. It helps the producing of glutathione, which is something the body needs to free from toxins. Eat raw vegetables and fruits! You should not cook the food while you’re detoxing your body. Detoxification is all about fresh and natural, so try not to ruin that feeling by cooking your food. Eat colorful! There are so many different colors of fruits and vegetables. In each of them, there’s a different type of antioxidant. Choose every color and enjoy in the diversity. High-fiber food! Food that is high in fiber is recommended in every detoxification method. It will also help you stay full for a longer time. Brown rice for example would fit perfectly in the detox process. Citrus fruits! Lemons, pineapple, kiwis, grapefruits and oranges are good in the detox process. However, you shouldn’t consume bananas, avocados or similar fruits because they contain more sugar and less juices. Herbal cleansers! Dandelion root tea and green tea are two of the things you have to incorporate in your detox diet. Dandelion root tea improves the digestion and helps the liver work properly. Green tea is full of antioxidants and speeds up your body processes. And both of them taste excellent! Probiotics! Probiotics in the form of yogurts will improve your digestion and will stimulate the colon cleansing. However, it is best if you leave them for later days. Try not to incorporate probiotics since day one. Deep breaths! By taking deep breaths you allow the oxygen to enter your cells and you improve blood circulation. Small amounts of protein! You can find nuts to be a great source of protein. Beans can also be an alternative for protein. Lemons! Pour some lemon juice in your water. Lemon acids contribute in cleansing the body from toxins. Do something positive! Last but not least, try to be happy. Do positive things. Surround yourself with positive people. Laugh a lot, talk a lot, dance and sing a lot. Happiness is a key factor in cleansing your mind. The most important thing about a detox diet is probably remembering not to consume certain foods. It seems easy, but sometimes it can be really tricky, especially for products that you consume every day. For instance, you probably won’t remember not to put white sugar in your coffee, or even remember that you are not supposed to drink coffee at all. So here’s a list that can help you with defining what not to eat. Meat – it is better if you leave out the meat for these few days. Meat takes a lot more time to process and can contain fats. We surely do not want that! Dairy Products – milk, cheese, milk cream, butter and all milk-based products in general. Eggs –it is best if you avoid all animal products, including eggs and pastries and other groceries that contain eggs. Alcohol – detoxification and cleansing is about flushing all the toxins out of the body, not about drinking more toxins. Alcohol is a big DON’T! Caffeine – when drinking both caffeine drinks and alcohol, the liver must first get rid of those toxins, so it doesn’t have much time for cleansing other toxins. Salt and sugar – Try to avoid using too much salt with food. And instead of white sugar, use natural sweeteners like honey or stevia. Processed foods – While cleansing your body, try to eat only raw foods. When you buy something from the market, look at the ingredients at the back and if there’s something you don’t know what it is, don’t buy it. Wheat – exclude all foods from your daily menu that contain wheat. That means that you should not eat bread, pasta, cakes and pies, or any other kind of pastries. Cigarettes – if you are a smoker, this can be a big problem. Smoking is one of the things that you MUST quit during cleansing. Smoking while detoxing is like trying to wash the soap from the sponge, but at the same time adding more shower gel. You know how annoying that is, right? Why bother to cleanse from toxins if you’re breathing toxins? Soda – eliminate all kinds of sodas from your menu. Instead, drink fresh juices and herbal teas. Every average modern man is exposed to numerous toxins consumed through unhealthy food, water and even air. The environment today is more toxic than ever before. Like it or not, we are part of the environment and our bodies are loaded with toxins. So it’s up to us to try to do something about it. 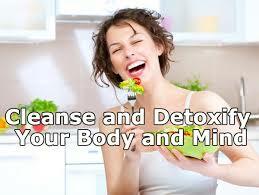 Detoxification is an enormous help that your body will appreciate a lot. Take the first step into a new, fresh and clean life, and start the cleansing today!